Well, it's that time of the year kids. Christmas = cookies! And I hope not to disappoint. I'm not going to be as unrealistically ridiculous as to try to make a different cookie every day, but I have gotten a little tired of my usual Christmas baking (except for the Mexican Wine Cookies - the butter is softening for those as I write) so I am experimenting with other options. 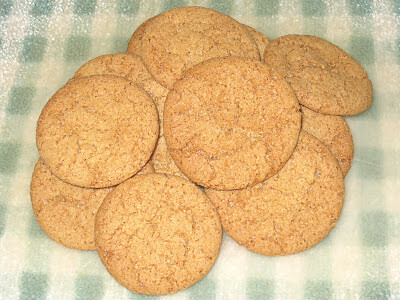 I found this recipe for Cornish Fairings in my new favorite cookie cookbook, The International Cookie Cookbook, by Nancy Baggett. It has been sitting on my bookshelf for years now, and I finally went through recently and started marking recipes I wanted to try. By the time I was done, the book had dozens of post-it tabs sticking out of the top. In fact, I was intimidated by how many cookies I wanted to try, so back on the shelf it went so I wouldn't have to decide where to start. I have been in a cookie-making mode lately, so I decided it was time to pull it back down and start making some decisions. I have been experimenting with spice/ginger/molasses cookies lately so when I read through the recipe for Cornish Fairings it seemed like a good place to start. Not surprisingly, the Cornish Fairing is most commonly found in Cornwall, where a fairing was originally known as any edible treat found or sold at a local fair. Over the years it has come to be more specifically associated with this spicy gingery biscuit, or cookie as we would call it here in the States. The main thing that interested me about this cookie is that, while it is similar to the cookies I have been making recently, it does not have any molasses in it. I was interested to see how that would make it distinguishable from the other cookies I have been making. And it did make a difference. Without the molasses, the cookies are lighter and sweeter. The spices are there, but they do not overtake the overall flavor of the cookie. While I do love the dark, sultry flavor that molasses provides, it was a refreshing change to have a lighter spice flavor come shining through. This recipe (and several others in the book) calls for golden syrup, which is common in Great Britain but not so common here. For years I had no idea what that was and assumed it was the same as corn syrup. It is not. According to Baggett, you can substitute dark corn syrup for the golden syrup, but the cookie will not come out the same. After searching for years, I finally found Lyle's Golden Syrup at my neighborhood Treasure Island, but the last time I was in Austin I actually found some at HEB, a local chain, so it has gotten easier to find. It is worth seeking out if you plan to make this recipe, or any recipe that specifically calls for it. Corn syrup is not at all the same. Golden syrup has the same taste, look and feel as pure cane syrup (or perhaps I should say, as I imagine pure cane syrup to taste; I can't say as I've ever tasted it). Corn syrup, while probably just as sweet, has less flavor, and the flavor is more muddled. There's a muted tone to it that somehow blunts the sweetness in an undesirable (to me) way. Your mileage may vary, of course. But, whether you use the golden syrup or dark corn syrup, you really should try these cookies. They are light, sweet, and spicy without the sometimes cloying cloak of molasses. Preheat the oven to 375 deg. F. Generously grease several baking sheets and set aside. Thoroughly stir together flour, baking powder, baking soda, cinnamon, ginger, nutmeg and cloves. In a large mixing bowl, combine butter and sugar and beat with an electric mixer on medium speed until light and smooth. Add egg, lemon zest, and golden syrup and continue beating until thoroughly blended and smooth. Gradually beat in about half the dry ingredients. As dough stiffens, stir in remaining dry ingredients using a large wooden spoon. To form cookies, pull off small pieces of dough and roll between the palms to form 1-inch balls. Space about 2-1/2 inches apart on baking sheets. Press down balls with the heel of the hand to flatten them just slightly. Place in the upper third of the oven and bake for 9 to 11 minutes, or until cookies are a rich brown and slightly darker around edges. (The cookies will puff up and then "fall" as they bake, which gives them a crackled surface.) Remove baking sheets from oven and let stand for 1 to 2 minutes. Then, use a spatula to transfer cookies to wire racks and let stand until cooled completely. Store cookies in an airtight container for up to a week. Freeze for longer storage.